I had the privilege of participating as a fishing buddy at a Project Healing Warriors retreat at Broken Bow, OK this week. One of the young wounded warriors was severely wounded and could not use this left hand to tend the fly line on a traditional fly rod. I had my TFO 11'6" Soft Hackle Tenkara rod with me and figured this might be the solution to help him enjoy fly fishing. He started using it and low and behold he caught his first rainbow trout on the rod. You can tell by the smile on his face he was very happy. I suggested to the leader that he might want to had a couple of Tenkara rods to his arsenal. 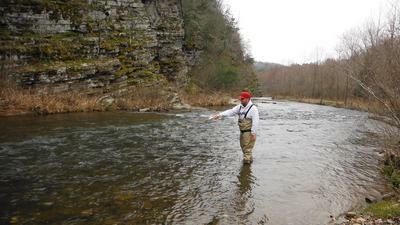 What a great tool to make fly fishing available to our wounded and disabled citizens. Thank you for helping and supporting our brothers and sisters who put them selves before others to keep us safe and free. They are always in my thoughts and prayers. Thanks for sharing your time and reporting about your experience with PHW. I wasn't aware there was an active local PHW until Thursday when a lady on the radio made a brief statement saying PHW was looking for help. That evening I found that PHW is located at VAMC 2 hours south from where I live, sent an email stating I don't know anything about western fly fishing but know a little about a Japanese style called Tenkara. 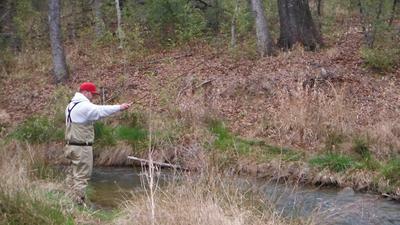 Sent links to a few on-line stories about PHW + Tenkara. Offered to help if the idea interested them. Thus far no reply. I will give it a week before trying again. God bless you for work with our wounded heroes. I recently donated an entire outfit to a local Project Healing Waters unit to help those who fought for our country. How wonderful it would be if all of the tenkara junkies donated some of their extra gear so our wounded veterans could enjoy the outdoors once again. I mean, really, how many rods do we really need? FYI, my wife could give you that number!!! Martin, thank you for your helping out with the Wounded Warriors and your quick thinking that a tenkara rod might help the soldier you fished with. 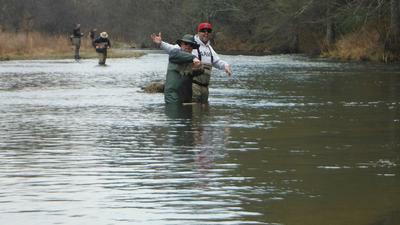 I'd heard some time ago that either the Wounded Warriors project or Casting for Recovery, I forget which, was not at all enthusiastic about tenkara, saying "we teach fly fishing." I hope that stance has changed. I suspect your actions may help change it. Tenkara certainly isn't the answer to everything, but I do think in some cases it could make a difference. Since my posting I have been in touch with Rick Pope of Temple Fork Outfitters. He is very supportive of the program and really likes the idea of using Tenkara rods as a tool for our wounded warriors. I mentioned it to a fly fishing friend of mine and he has donated monies to purchase two TFO Tenkara rods for the Project Healing Waters of North Texas. We will test them out in May at our next program. Thank you all for your supporting comments.